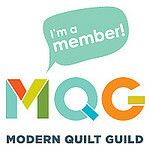 Last Saturday night we ventured out locally and went to the Los Angeles Modern Quilt Guild Show. It is an annual event and that keeps getting bigger and better. There is so much talent in the LA Modern Guild. All these beautiful quilts were put up for a one evening show…and what an evening it was! Everyone enjoyed the quilts and friends, as well as the wine and hors d’oeuvres.